the return of cat blogging! The weeks since the death of my beloved Foster were very sad ones. A writer's day can be a challenge for an extrovert such as I am, and I didn't fully realize how much during the day I depended on the household cats for touch, companionship, and healthy, playful distraction until, for the first time in roughly seventeen years, there weren't any feline companions around the house. The emptiness of the house was a burden added to that of missing Foster. We found Clio and Clare in the Massachusetts PCA shelter. They're sisters who had been adopted from that same shelter when they were kittens, but left at the shelter again at age four when the person who adopted them moved into an apartment that didn't allow pets. Everybody adores cute, tiny kittens, so shelter staff often have a difficult time finding homes for the adult cats. But these cuties were so adorable and affectionate that we knew they belonged with us. 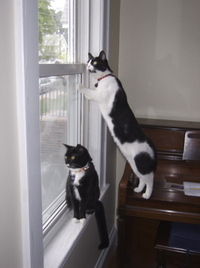 Clio (on her hind feet leaning against the window) is the instigator of much mischief in the house. Every object she sees becomes a cat toy to her, and she especially likes chewing through the bags in which we store potatoes and onions. Her favorite occupations include napping and punching thousands of holes in boxes with her teeth -- sort of like the love-child of a vampire and a termite. But she is adorable, and is not at all shy about asking for affection when she wants it -- which is roughly 80% of the time she's awake. 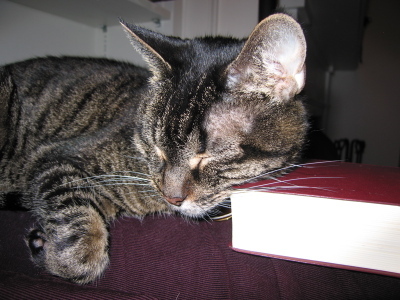 Oh, and Clio was named for the muse of history. I figured that if having the very muse of history on my lap didn't help me garner enough enthusiasm to finish my Ph.D. dissertation, nothing would. And do meet Clare, sitting on the window sill. She has claimed my study as her own, and she's clearly a writer. One of her favorite pasttimes is jumping up to the keyboard when I'm writing and contributing text of her own. She's a bit mellower than Clio -- the source of her name, after St. Clare, the contemplative -- but loves to play games of tag, contests to see who can knock the most things over racing around the house, and engage in mutual grooming with her sister. 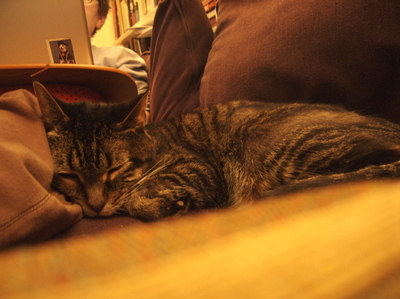 She also loves napping -- preferably curled up with Clio like a dappled yin-yang symbol. 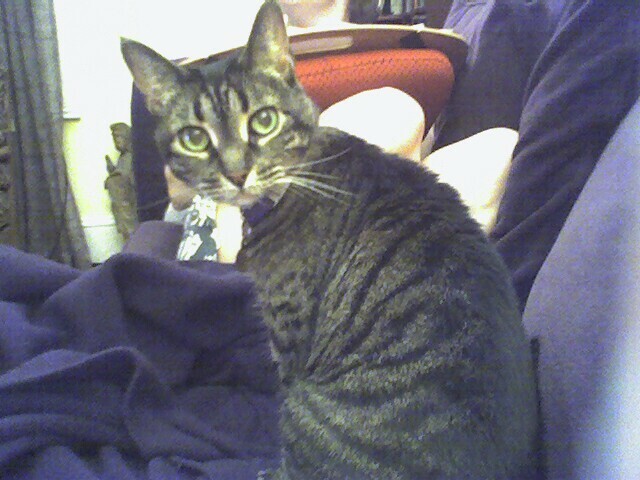 I do love these girls, and I hope you'll enjoy seeing them for Friday catblogging in the weeks to come! 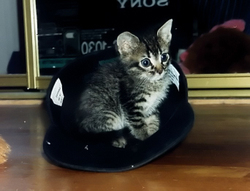 In 1993, when our cat, Foster, came to live with me, she was small enough to make a baseball cap look like a full-sized jacuzzi in comparison (as this photo, taken on the day she came to live with me, demonstrates). She was my baby. I fed her with a bottle, and set up a little stairway of pillows and such so she could climb into bed with me, as she invariably did -- she liked to keep her head or neck pressed up right against a pulse point on my neck as often as she could. Indeed, she often rode around the house on my shoulder like a pirate's parrot while I washed dishes or cooked, so she could stay pressed up against my pulse, and occasionally hide in or chew my hair (the latter of which remained one of her favorite activities as recently as last night). Foster never grew all that big, and she never lost her kittenish ways. 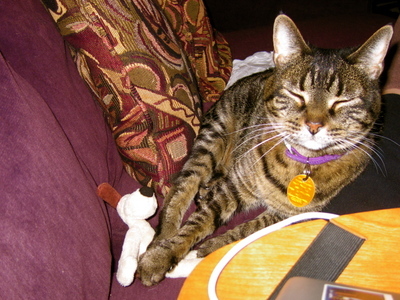 She was a truly excellent mouser throughout her life, and I think she was somewhat disappointed that our apartment at seminary afforded her no opportunities to hunt anything more challenging than dust bunnies. She was a bundle of mischief, and even in her twilight years, a bundle of energy, through a bundle slightly dwindled over the years. When my partner came to live with me, Foster gamely (if somewhat grumpily) navigated the new family dynamics, and especially as our other two cats passed away, Foster settled on a few favorite activities: chewing on my hair and kneading my chest, licking my partner's face (my partner got a nightly bath from Foster quite regularly over the last few months), and most of all, positioning herself so that she was touching both of us, whether on the couch or in bed. I think it was within the last couple of days that I turned toward Karen in bed to say with a chuckle (for the thousandth time at least), "I have a feeling that someone has come between us," as Foster curled up and settled for the night with half of her on each of our pillows. 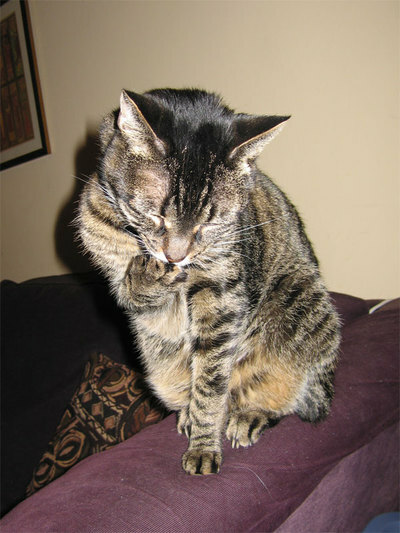 But Foster's kidneys had been failing for quite some time, and we suspected the nightly doses of subcutaneous fluids and vitamins were less and less able to compensate for what her kidneys couldn't do. Today Foster clearly wasn't herself, and by afternoon her breathing was rapid and shallow, and not even her favorite ear-rub could raise a purr. We took her to the hospital, and clearly the time had come for her to leave us. 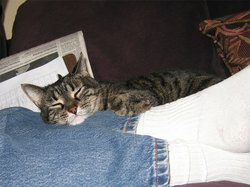 She died this afternoon at about 4:15, I think, with me rubbing her ear and Karen petting her as the drugs took effect. I keep seeing a shape on the sofa behind me or a shadow in the hall and thinking it's her, and it's hard to imagine going to bed without her jumping up to join us, demanding attention and affection and then settling down, touching both of us if possible. I miss her like crazy already. 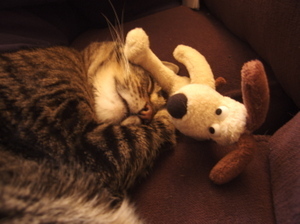 Foster sure loves her little Gromit doll. Heck, Foster sure loves her life. I'd love her life. 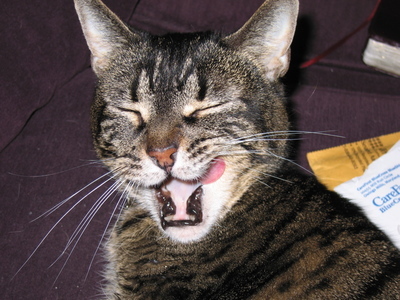 Why wait until Friday for catblogging when today is St. Francis' Day? Some people say that too many Episcopalians just aren't sufficiently attached to scripture, but this clearly doesn't apply to our Foster, who just LOVES the bible -- especially the New Testament in Greek. Wonder where she gets that from? I love gizmos. I'm not generally all that interested in how they work as long as they're working, but I'm very much interested in what one can do with them. I've got a new gizmo now -- a Treo 650 -- and one of the things I can do with it is moblog -- short for "mobile blog." I have not, however, thought of any particular reason it might be all that helpful to be able to do this. I still can't resist trying it out, though, so here' a one-time special feature: Wednesday cat moblogging, with picture taken and entry posted using my Treo. Enjoy!